To add gallery to your page simply click on gallery shortcode button, that can be found integrated in default editor panel in visual mode. See image below. “Taxonomy terms” option allows you to choose one of gallery categories. If you want to use sortable gallery, you need to choose parent category of your sortable categories. “Filterable gallery” – check this option if you want use filterable gallery. “Show per page” – number of gallery posts per page. “Pagination” – Check this option if you want show pagination. Please note, that you cannot use pagination in sortable gallery. “Layout Type” option allows you to choose one of the 3 available gallery layouts: “Big”, “Medium”, “Small”. 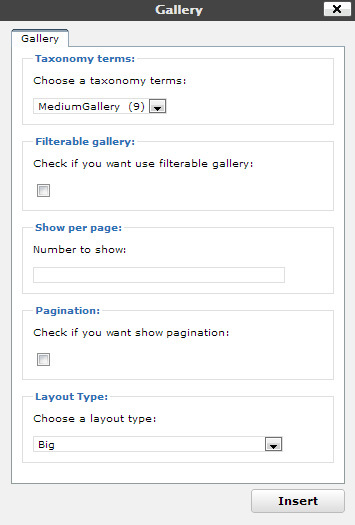 Please note, that you can not have “Filterable gallery” with “Pagination”.